The Cleft and Shimmering Hour. Photo courtesy of the Portrait Society. The land and the human struggle to conquer the vicissitudes of climate and resources become themes in two new exhibitions at Portrait Society, opening with a reception from 6 to 8 p.m. on Friday, January 13, 2017. The exhibition runs through March 26, 2017. Gallery Night is January 20. “The Cleft and Shimmering Hour,” is an exhibition of photographs, sculptural photographs, and video work by Shana McCaw and Brent Budsberg, in collaboration with filmmaker Tate Bunker. The artists’ ongoing projects investigate subjective perceptions of the past, and the disparities between genealogy, archaeology, “official” history and the influence of Hollywood and popular culture. 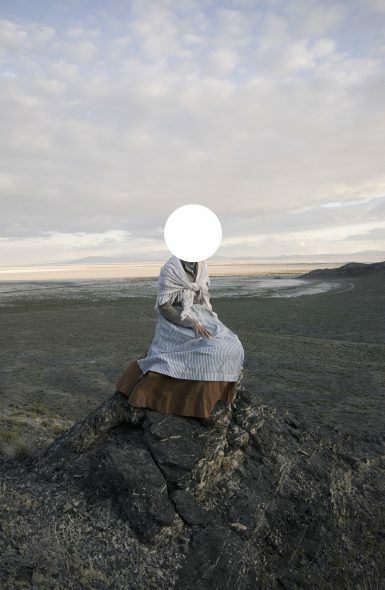 As in previous bodies of work, McCaw and Budsberg assume the roles of pioneering settlers, dressing in character to photograph or film themselves in various staged scenarios. Historical fact, they remind us, is never as substantial and authentic as it might seem. “The Cleft and Shimmering Hour” will feature photographs taken of an installation built for “The Museum of Rooms” at the Chipstone Foundation’s carriage house in Fox Point, Wisconsin. McCaw and Budsberg’s room, titled “A Study for a Character,” functions as a film set embodying the interior life of McCaw’s female character and a subject through which the artists explore their uncomfortable relationship with romanticism and conventional approaches to beauty in art and photography. Several sculptural photographs will also be included, exploring the picture frame as a psychological construct where the boundary between our immediate surroundings and the reality depicted in the photograph is no longer neatly and conventionally partitioned. The exhibition’s video installation is compiled from footage shot for a longer project called “The Inhabitants.” Encompassing cinematic narrative, sculpture, installation, photography, and performance, McCaw and Budsberg’s film abandons the traditional linear format and instead presents three distinct scenes that create an environment of simultaneous and overlapping moments. This is McCaw and Budsberg’s second solo exhibition at Portrait Society. Their work was included in the 2016 Wisconsin Triennial at the Madison Museum of Contemporary Art. Other recent exhibitions include Ripon College; SPACES Gallery, Cleveland; Lynden Sculpture Garden, River Hills; James Watrous Gallery, Madison; Wright Museum of Art, Beloit; Galerie San Nom, Canada; Soap Factory, Minneapolis, MN; John Michael Kohler Arts Center, Sheboygan; Usable Space, Milwaukee. 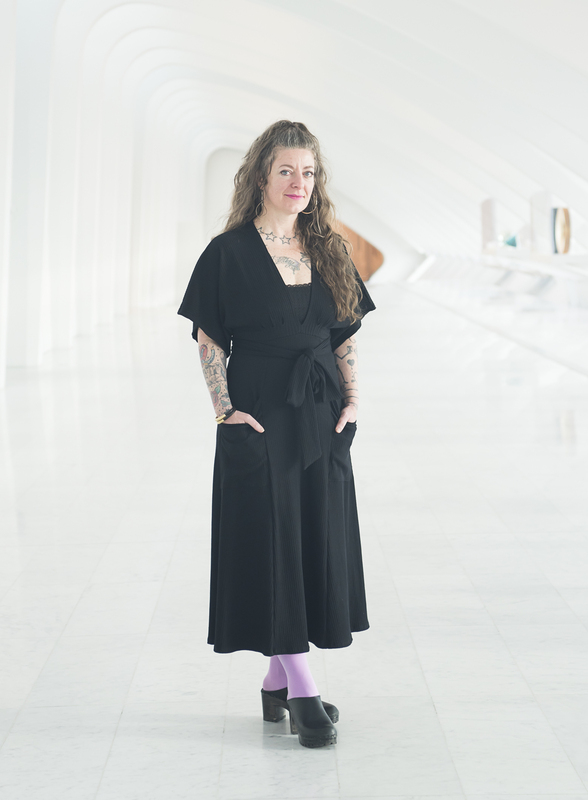 Shana McCaw was recently named curator at Villa Terrace and Charles Allis art museums. They received Mary L Nohl Fellowships in 2008 and 2014. Robert Lahmann: Countryside. Photo courtesy of the Portrait Society. A separate exhibition, “Ideal State,” in the front gallery, features watercolor paintings of the Wisconsin landscape from the estate of Robert Lahmann (1923-2014). Like many post World War II vets, Lahmann returned from the war and attended college on the GI bill, graduating from the Layton School of Art, Milwaukee, in 1949 where he studied with Gerrit V. Sinclair (1890-1955). While living on a hobby farm in Monches, Wi and raising a family, Lahmann worked at a variety of jobs including as a sculptor at the Milwaukee County Zoo. He eventually became a machinist at Milwaukee Electric Tool Corporation, retiring after 20 years. 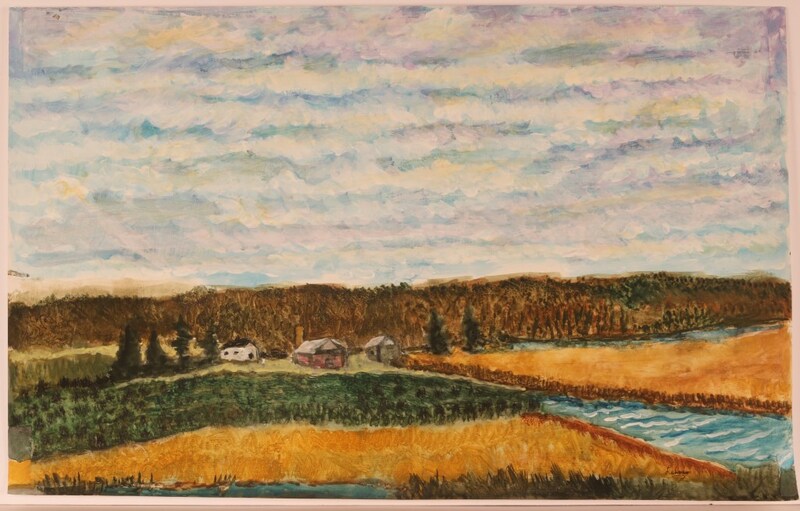 Even while working full-time, Lahmann executed oil paintings as well as a series of about 400 plein-air watercolor studies done between 1970 and 1995. Before Lahmann headed to his second-shift job at Milwaukee Electric, he would hop in his Chevy Nova and drive into the country where he would park the car and paint the surroundings, often focusing on pastoral scenes, farm land, cows, country homes and the landscape. Much like his teacher Gerrit Sinclair and colleague Schomer Lichtner, Lahmann loved the landscapes of Wisconsin but he must have also felt the encroachment of the suburbs as he drove into Brookfield for work. Perhaps this fueled his desire to record and sometimes embellish these scenes. One can picture Mr. Lahmann parked by the side of the road, grateful that he has a few hours alone to paint and that the cows hold still and the clouds are particularly dynamic at this moment, this day. Looking at these paintings now, they seem as much fiction as fact, like illustrations in a story book when glowing autumn colors, lazy cows and afternoon rain showers were not tainted by corporate farming practice, hybrid crops, deer ticks and extreme weather conditions. One can still see these scenes on any rural road, but they resonate against what we’ve lost, namely the family farm and a less contested view of nature. These paintings now seem fragile because they record the slippage of a historic notion of purity. Like McCaw and Budsberg’s work, Lahmann’s watercolors feel familiar but far away — part reality, part fantasy, historic and dreamlike. Kiki Smith is an important American artist who often deals with issues of the female body, weaving myth and fairy tales into her work. November 24 through December 30, 2017. 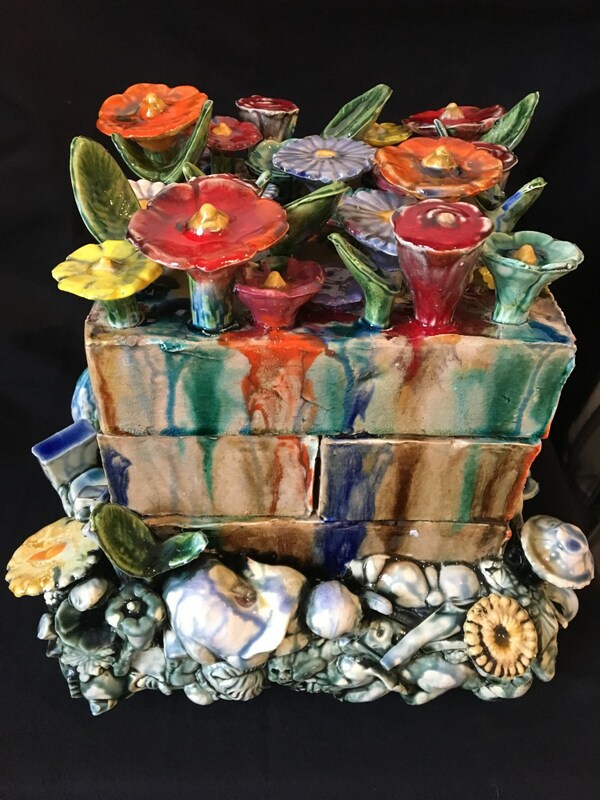 OPENING RECEPTION: Saturday, November 25, noon to 5 p.m.